Management of Strika has publicly spoken out about the raising issue going around their client and didn't hold back but revealed more shocking revelations. We've got the scoop here. 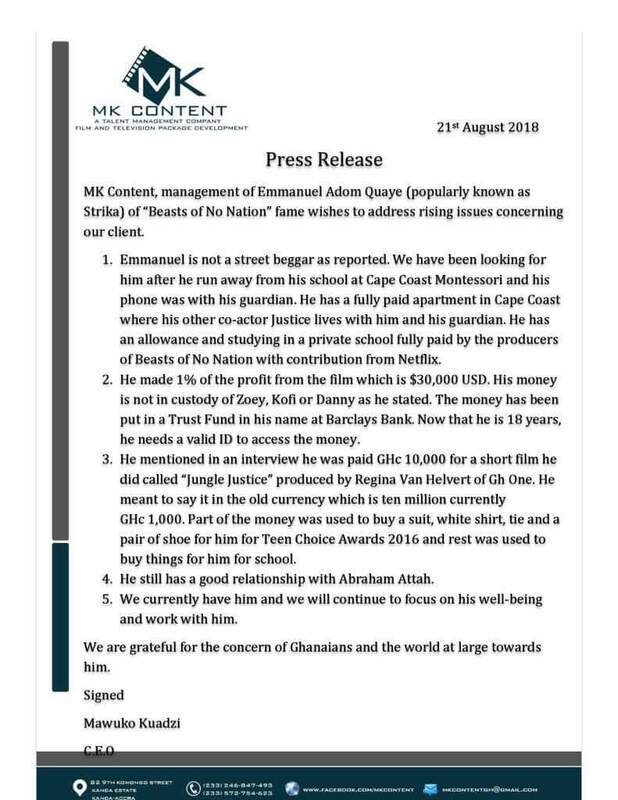 MK Content has proved that Emmanuel Adom Quaye popularly known as Strika of 'Beast Of No Nation' fame is not a street begger as reported. They claim they don't know his whereabout since he was gone missing after running away from school. Yesterday, according to some posts and pictures we stumbled upon on social media, Strika was spotted begging on the street of Kaneshie by one comrade from the Ghana Institute of Journalism Caleb Boye, which called for the attention of some concern Ghanaians and media outlet. Others went on to vent their emotions on Strika's current situation. It was very bad. Today, report reaching is that MK content, which happens to be the management of Strika has replied Ghanaians and are ready to prove beyond doubt that their client Strika is not a street begger and also made some needed correction to informations which has been misinterpreted. Below is the press release from MK Content, Management of Strika. Read through and leave a comment below.